The value of your company is partly determined by your industry. For example, cloud-based software companies are generally worth a lot more than printing companies these days. However, when we analyze businesses in the same industry, we still see major variations in valuation. The Value Builder Score was developed by a team of researchers led by John Warrillow, author of the bestseller Built to Sell: Creating a Business That Can Thrive Without You. The book inspired a movement of entrepreneurs and advisors who recognize that the ultimate test of a business is not how big it is but how valuable it can become. 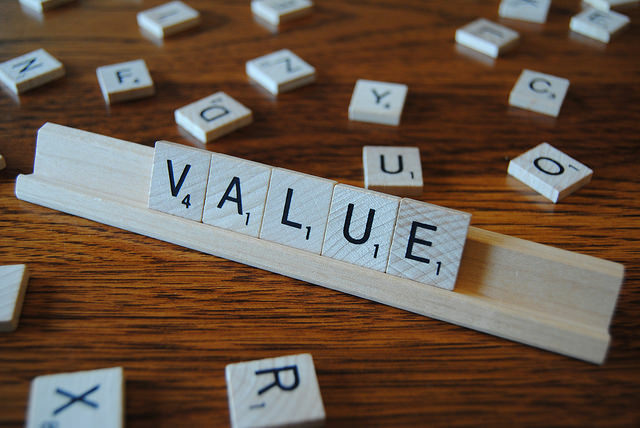 When they dug into the data from the over 14,000 businesses who have completed the Value Builder questionnaire, they discovered 10 things that will make your company more valuable than your industry peers. The more revenue you have from automatically recurring contracts or subscriptions, the more valuable your business will be to a buyer. Even if subscriptions are not the norm in your industry, if you can find some form of recurring revenue it will make your company much more valuable than those of your competitors. The emerging subscription economy offers huge opportunities far beyond traditional subscription-based business models like technology and media. Companies in nearly any industry, from start-ups to the Fortune 500, from contractors and florists to professional service providers can build subscriptions into their business to improve cash flow, ignite growth and boost overall value. For example, companies with a tightly defined niche market and expert knowledge, like The Wood Whisperer Guild, Contractor-Selling.com and DanceStudioOwner.com sell access to highly specialized, high-quality information. Companies like Mosquito Squad (pest control) and Hassle Free Homes (home maintenance) take a recurring task off your to-do list. Others like BarkBox (dog treats) and Dollar Shave Club (razor blades) send their subscribers packaged goods each month. The first step to finding your unique value proposition is to identify and describe the functional jobs your customers are trying to get done. This includes tasks they are trying to complete, problems they’re trying to solve or emotional needs they’re trying to satisfy. Keep asking yourself why a customer wants to perform a certain job to get closer to understanding the real motivations that drive them. Then look at their pains or outcomes they would like to reduce or eliminate, as well as potential gains or outcomes they would like to achieve or improve upon. Find out precisely what barriers are preventing or making it difficult to get a job done as well as exactly how much improvement is needed to make it feel like a gain. Try to forget what you’re offering and go beyond just the jobs, pains and gains you hope to address with your value proposition. The next step is to list all the products and services you offer that help your customers get a functional, social or emotional job done and then describe exactly how they either relieve a customer pain or create a gain. This exercise will give you a blueprint or “value inventory list” of your ideal customers’ pain relievers and gain creators, ranked in order of importance and relevance to them. Selling lots of things to only a few customers risks making your business owner dependent because you are likely the only person with enough industry knowledge to successfully deliver such a broad product or service line. The secret to scaling is to sell less stuff to more people. Another growth factor is your potential to scale geographically, so think about what you would need to do to replicate your success in another market. Tired old companies often try to bump up their brand’s appeal through the acquisition of a trendy young company in their industry. If you are the darling of your industry trade media, expect to get a premium acquisition offer. If you have a great location with natural physical characteristics that are difficult to replicate (imagine an oceanfront restaurant on a strip of beach where the city has stopped granting new licenses to operate), you’ll have buyers interested in your location as well as your business. Companies that can naturally hedge the loss of a single customer pose less risk than those that rely on a small number of customers. Try to ensure that no customer amounts to more than 10 percent of your revenue and your company will be more valuable than industry peers that have only a few big customers. If you’ve mastered a way to win customers and documented your sales process with a predictable set of conversion rates, your secret customer-acquiring formula will make your business more valuable than an industry peer who doesn’t have a clue where their next customer will come from. This is where implementing a Marketing System can really help ensure more predictable revenue streams. Companies that invest in audited statements have financials that are generally viewed as more trustworthy and therefore more valuable. You may want to get your books reviewed professionally each year even if audited statements are not the norm in your industry. Companies with a second-in-command who has agreed to stay on post sale are more valuable than businesses where all the power and knowledge are in the hands of the owner. Being able to objectively demonstrate that your customers are happy and intend to re-purchase in the future will make your business more valuable than an industry peer that does not have a means of tracking customer satisfaction. Consider using the Net Promoter Score survey question that measures the likelihood your customers would recommend your company to a friend or colleague. Like a rising tide that lifts all boats, your industry typically defines a range of multiples within which your business is likely to fall into; but whether you fall at the bottom or the top of that range comes down to factors that have nothing to do with what you do, but instead, how you do it. The ultimate test of value for your business can be found in a simple question: Would someone want to buy your company? Whether you want to sell next year, a decade from now, or ensure you leave a legacy by passing the business down to family or employees, you need to build a valuable asset that is not dependent on you, because being sellable gives you the ultimate freedom. Please share what steps you are taking to increase the value of your business. Get Your Value Builder Score Now to check the health of your business. Discover your company’s hidden assets as well as the silent killers that could undermine its value.